Row House, Hallowell’s historic preservation organization, contributed $4,000 to the City of Hallowell for the purchase of the flag pole and it is dedicated in memory of Allen Strickland and Wesley Umphrey. The Beeman Cannon, more locally known as “ The Old Thunder Jug” was an English artillery piece taken from a British ship ,the HMS Boxer, after a battle with the USS Enterprise in Portland Harbor in the war of 1812. The ship was towed into Portland Harbor for dismantling. On the the barrel is cast the royal coat- of- arms of King George lll of England. Additionally,the weight of the barrel reads 11- 3 – 23. This translates into 11 hundred-weight (112 lbs per 100 weight); 3 quarters weights, and 23 lbs) for a total weight of 1339 pounds. The coming of the Cannon to Hallowell in the year 1839 originated in the mind of Captain John Beeman, a Hallowell citizen. That same year a wheelwright named Currier built a carriage and wheels for the gun and converted it to an artillery piece. Used for the purpose of firing salutes on each national holiday, it was also a memorial to the Hallowell Light Infantry Division and the Hallowell Artillery Company. Both served during the Revolution and the War of 1812. 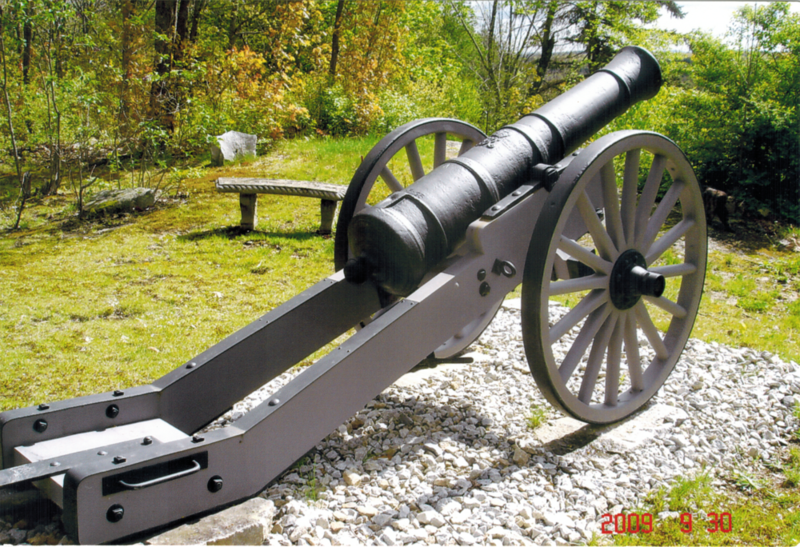 For many years the historic cannon was mounted on the lawn of the City Hall and subsequently to the Powderhouse Lot. Time took it’s toll on the carriage and wheels requiring a major rebuild. ROW HOUSE, the active historic preservation organization in Hallowell, encouraged and funded the project. ROW HOUSE was fortunate to engage Rob Saucier,Custom Carriage Works of South Gardiner to reconstruct all the cannon wooden structures.The wheel spokes and wooden wheel rims were manufactured by a wheelwright from the Amish country in Pennsylvania. The restoration of “The Old Thunder Jug “ turned out to be a work of art. After it was towed in the 2010 Old Hallowell Day parade it was returned to the “Hill” and sits proudly beside its working partner the” Powder House” on property historically known as “ Couch’s Ledge “ on High Street. In 2014 the City of Hallowell dedicated "Last Crane Standing", a monument to Hallowell's granite industry. The monument consists of a wooden granite quarry crane and interpretive panels, all set in a landscaped site in Granite City Park alongside the Kennebec River. The crane, a gift to the City of Hallowell from Key Bank, is the last example of such devices known to exist in Maine and which numbered in the hundreds if not thousands at one time. The crane is accompanied by interpretive panels with historic photographs and text relating to the more than 100 year history of Hallowell 's "magnificent white granite". The design for the installation was created by Hallowell artist Chris Cart and is suggestive of an abandoned quarry. The monument was initiated and supported by Row House, Inc., and made possible by the "Last Crane Standing Committee", a group of local volunteers. Local citizens and businesses contributed over $30,000 to make the monument a reality. On May 17, 2009, Museum In The Streets, a walking tour of historic Hallowell, was dedicated. The concept was created by Cushing, Me. resident Patrick Cardon, and is one of several such installations in the United States and Europe. The original tour consisted of 19 venues highlighting significant people, places and things from Hallowell's past and featured an English/French text together with historic photographs. In 2013 a 20th venue was added at the Powderhouse lot on High Street which includes a painting by Hallowell artist Chris Cart depicting members of the Hallowell Artillery Company and the Hallowell Light Infantry wearing their distinctive local uniforms. Museum In The Streets was a joint venture between the Hallowell Board of Trade and Row House, Inc., and funded by local citizens and businesses. It was accepted as part of the Maine Memory Network, a program of the Maine Historical Society. Dwellings: the unique homes of Hallowell is published by Row House, Inc. of Hallowell to celebrate the city’s 250th anniversary in 2012. Dwellings is a full-color, coffee table book with gorgeous photos of Hallowell’s varied historic, modern and even funky homes by photographer Bill Haley, book design by Chris Cart and printed locally by Hallowell Printing. Proceeds benefit Row House historic preservation projects. The book includes historic facts, architecture and current information surrounding these dwellings. This book makes a great holiday gift for anyone with connection to Hallowell and particularly for those with interest in Hallowell’s great history. This was a limited edition printing so the supplies won’t last forever. To see a list of the homes/addresses included on the Dwellings book click here. The Dwellings book is $30.00 and available here and at many downtown Hallowell stores. Soon you will also be able to purchase the book on Amazon and at Barnes and Noble…while supplies last. If you’d like you can buy now through our Row House PayPal account. All profits go to Row House efforts to preserve Hallowell buildings and history. Hallowell’s Historic House of Books, (the Hubbard Free Library), launched a Capital Campaign to raise funds to renovate and repair the building and to increase the number of available operating hours. Built in 1880, the building was in need of major infrastructure improvements to save this historic cornerstone of Hallowell’s Historic District. Major repairs were needed to the leaking slate roof, stabilization of the foundation, replacement of the heating system, egress and electrical code updates and handicapped accessability to bring the building to code and to be made viable for another century to meet educational and cultural needs of the community. Our community, including the Row House, Inc., successfully raised funds to complete most of the renovation. The second stage of the campaign is needed to restore the beautiful stained glass windows throughout the building.